Hi all, been a long time again. Sorry but life is busy. Happy birthday Jumble!! Lovely to see your smiling face again! Sorry a meet up didn't work for ATX but here's hoping we can try again at the net event in 2020! I am heading to Gatecon next month so will get to see llp and Martin. llp, sorry to hear about your house woes, is it all due to lack of rain? Unfortunately, I won't be able to make it to Gatecon now. Between all the various expenses of fixing my house up, it is going to wipe out any "fun and games" money I have put aside. This looks like it might cost me as much as $10,000 by the time everything gets repaired. Actually it is due to too much rain and water and a poor system of drainage on that side of the house. My neighbor on that side had issues as well, but his water also ran over to my corner of the house as well. So I am going to have to do a "rock" type drainage on that side of the house. Apparently the other neighbors on either side have done it already but the former owner of my house only did the one side???? Such fun - but still better then renting. Apparently, rentals have gone up sooo much over the last 10 years. The most annoying part is I could have been able to do some of this myself it I was younger. But at my age, no way. The body just doesn't want to do these things anymore. The land of SG1, Atlantis and Sanctuary! *huggles EH-T* Good to see you! Thanks to Pengyn, SamJackShipLover and Mala for the sig. So sorry about the house. That is pretty severe. Really sorry you can't make it to Gatecon, I was looking forward to seeing you again. Trust me, I would much prefer to go to Gatecon then to have to deal with this mess. And sadly, these days a lot more money seems to be going out rather then coming into my life. So I have to make these choices. Sounds like a lovely weekend. Other then Ben - did you ladies stay "relatively" sober? Good for you, especially adding the income back into your possible "spending on other things" side! 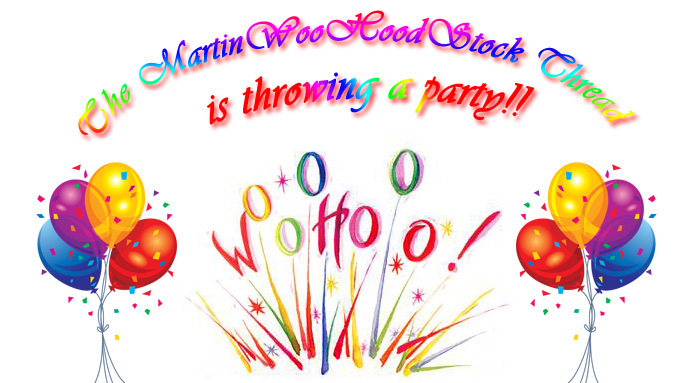 The MartinWooHoodStock thread will soon be ten years old – hard to believe! Lately the thread has been very quiet due to most of Martin’s WooHoos having moved on with their lives – getting boyfriends, getting engaged, building houses, getting married, having babies, travelling all over the world and generally getting on with happy lives – which is wonderful! So I’m looking ahead to MartinMas 2018 and thinking this is likely to be the last one. That being the case, it wood be lovely if we could try to make it a really good one so we can go out with a BANG!!! Please make your arties 680 x 383px and also put your name on - thanks! Last edited by Jumble; September 28th, 2018 at 06:41 AM. Sound like a great plan! Pol My Blog | My Fanfic | My FaceBook__ Sam: "Jack...please." Well so far the house has cost me close to $4000. I have my new water heater installed so I am back home again. However I still have the dining room, my second bathroom and my service porch totally torn up. Tomorrow I am in search of someone to put them back together. The floor (under the linoleum) will have to be replaced in the service porch. Walls in the other rooms. My back door - have no idea yet what to do with that yet. But being home is so much better. Although I will have to do my laundry somewhere other then my home, because the washer and dryer are in my dining room right now. Figure I still have a few more weeks like this. They took away several soaked and now moldy throw rugs. However, my biggest concern - my mother's beautiful 9' x 12' Chinese rug. It was soaked and strained. Hoping they can get it back to normal. That rug means so much to me because my Mom loved it so much. It is worth several thousand dollars but money is not what I want. I want that carpet back in the dining room as beautiful as ever and without water stains or mold. But, I really think they won't be able to do that. Only time will tell. Thanks Jumble, appreciate that. They are still drying out the dining room and back room - that will go on until Monday. After that it is up to me to find the people to replace everything. I would really like to put in some Pergo (manufactured wood) floors but after spending all that money I don't have the "extra" I would need. Plus I would have to include three bedrooms, living room and hallway. All my money went to keeping what I have left (in the from of water) from running down the sewers. So I guess on Monday after they remove all the dryers - I am out to look at more linoleum. (Liked the arm wrestling video - either Martin is really strong or Peter is a wimp or both!